Everything You Wanted To Know About Supernatural at Comic Con 2018 – Part One! It’s no secret to anyone who has ever read one of my Supernatural books that I love Comic Con – my first year there was 2007, when you could still drive your rental car right up to the convention center, park in the underground garage and stroll up to get in the (very small) line to get in. It was Supernatural that brought me to Comic Con back then, and it’s still Supernatural that brings me back now, and every year in between. The Show has gone from Room 6BCF to the larger Ballroom 20 and finally for the past few years, the gigantic Hall H. Like many loyal fans, I’ve followed along and celebrated the Show’s success as it defied the odds and refused to be cancelled. Last year saw a triumphant celebration of that tenacity, with Kansas appearing to play the Show’s unofficial theme song, Carry On Wayward Son, live on the Hall H stage. Nobody expected Warner Brothers to top that amazing feat this year, and yet anticipation was high for our first glimpse of Season 14 – and Supernatural (as always) did not disappoint. My Supernatural-centric Comic Con began on Thursday night with the Wayward Cocktails party in the Gaslamp district’s Analog Bar. Jules Wilkinson (better known as admin of the SuperWiki) and friends throw this party most years, and it’s a great place to meet up with all your fellow Supernatural fans. It’s also a charity event, so I brought along some copies of Family Don’t End With Blood to donate, benefiting Random Acts and Public Counsel, a legal services advocacy organization. All the television screens in the bar were playing episodes of Supernatural, there were Supernatural themed drinks, plenty of food, and of course pie for dessert. 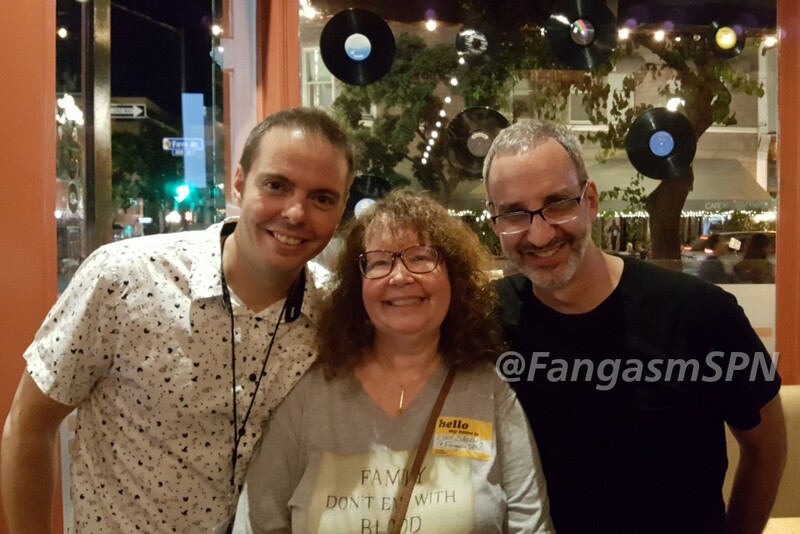 Ruth Connell joined us at our table for a while, and I had a chance to chat with Scoobynatural writers Jeremy Adams and Jim Krieg, who would love nothing more than to reprise that amazing episode. I also got to hug some of the people who keep the Show awesome, like the always adorable post coordinator Mary Manchin and showrunner’s assistant Meghan – and to talk Season 14 a bit with writer Davy Perez. He’s excited about the upcoming episode written by Meredith Glynn and that makes ME even more excited! More on that later, because SQUEE! Friday stayed Supernatural-focused with the Warner Bros. party at Float, the rooftop bar of the Hard Rock Hotel. 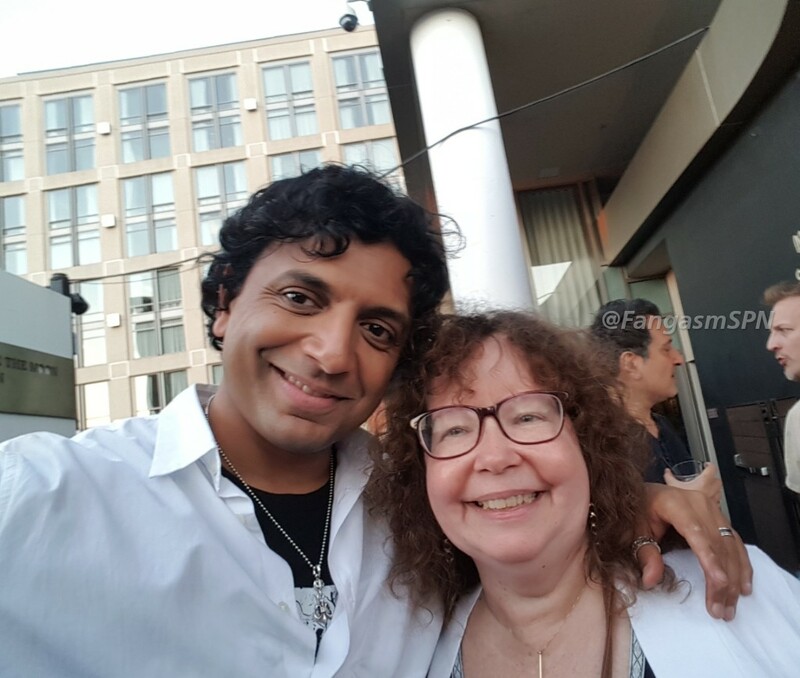 My friend M. Night Shyamalan was also at Comic Con, premiering the trailer for his new film Glass (more about that coming up!) 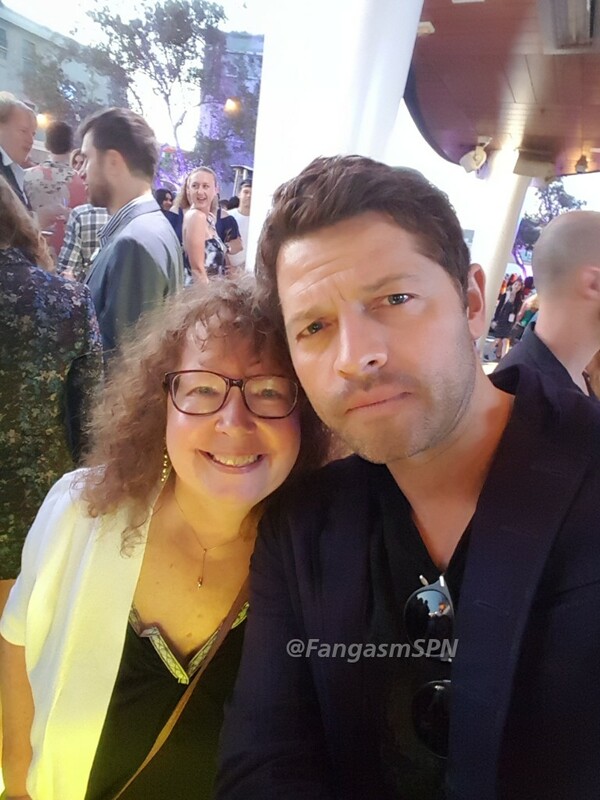 so I invited him to come by the WB party – because it’s always a fabulous party! He stayed long enough to chat for a little while, and then ran into Jensen Ackles as he was leaving, so they got to reconnect too. That’s what makes Comic Con so awesome! Along with my good friends Laurena and Alice, I chatted Season 14 of Supernatural at the party with producer Jim Michaels while we sampled the delicious food and drinks, including the pros and cons of a reduced season of 20 episodes instead of 23. I was thrilled to hear that Jim’s optimism about the Show continuing for a while matches my own. We also were happy to run into showrunner and director Bob Singer and his wife, writer and executive producer Eugenie Ross-Leming. Both are excited about the new season, even if Bob did try to retire a few years ago – but we all know how that turned out! Jensen Ackles, Jared Padalecki, Misha Collins and Alex Calvert joined the party a short while in and stayed until they literally turned the lights on to try to convince those of us who were having way too good a time to finally leave – sorry, Float employees! My chats with Jensen were about his singing prowess and whether he’d run into Night before Night had to leave (he had, in the elevator! ), with Jared about his recent birthday, and with Misha about politics – and whether I need a new phone (I do). My chats with Alex were a bit more substantial – I can’t say enough about what a lovely person Alex is and how thoughtful about this unique situation he finds himself in. Needless to say, he was nervous about being onstage at Hall H in front of 8000 people on Sunday, but as I told him that night – the rest of the cast have his back. And so does the fandom. Last week’s Supernatural episode was one of the special ones – unlikely, risky, innovative, the sort of episode that when you hear the idea half of you is going “What now?” and the other half is immediately jumping up and down and yelling “Hell yeah!” One of the things I cherish most about this Show that I’ve loved for thirteen years is its fearlessness. It started life on a network that disappeared by the time its first season was over, with a person in charge who didn’t understand what it was or why anyone would like it, managed to get picked up on the successor network that no one expected to make a long term go of it, sat precariously on the bubble for its first four or five seasons, and half the time since, and yet all that time the show never “played it safe”. As Jensen Ackles said when he and Jared Padalecki appeared on ‘The Talk’, at their audition the show broke protocol – and they’ve been breaking it ever since! In the past it’s been an episode that takes place on a television set, with all the meta commentary that brings; incorporating Supernatural the book series directly into Supernatural the television show; the boys zapped into sitcom hell by the Trickster; an episode that revolved around ghost sickness and saw Dean screaming in terror over house cats and running from tiny dogs; an episode shot entirely from the point of view of the Winchesters’ beloved Impala; and the meta episode of all meta episodes in which Jared and Jensen play Sam and Dean playing Jared and Jensen. 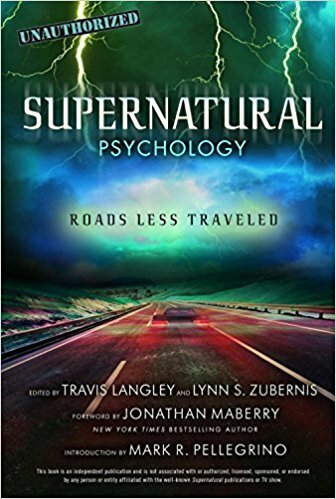 When it came time to celebrate Supernatural’s 200th episode, they marked that milestone with an episode titled “Fanfiction” which was an homage to every aspect of fandom, even the ones not usually talked about. I don’t think there’s another show that has dared to go so meta so often, and the brilliant writers and actors have pulled it off every single time. The latest experimental episode, Scoobynatural, was no exception. An epic crossover worthy of the best fanfic, the episode saw Sam and Dean sucked into their brand new big screen TV and right into Dean’s favorite cartoon, Scooby Doo. The episode took over a year to finish, so the anticipation has been building for some time. Warner Bros. did their part lining up some talk show appearances, and the airing of the episode also coincided with Supernatural’s third appearance at PaleyFest, so that meant the fandom has had a veritable feast of Supernatural content for the past month. And it has been glorious! One of the things you can count on about an episode of Supernatural is that some people will love it and some people will hate it, sometimes for exactly the same things. But Scoobynatural is one of those very rare episodes that most people agreed on – not everyone was over the moon for it, but few had any issues with it and a lot of fans absolutely loved it. It doesn’t hurt that the cast clearly had a blast making it and as fans of Scooby Doo themselves, their enthusiasm shone through every time they talked about it. Jared, Jensen and Misha were glowing at PaleyFest, happy to greet the gathered throng of fans and answer questions about the show. Even the Impala showed up, posing alongside the Mystery Machine in anticipation of the crossover. When Thursday night was finally here, I grabbed a slice of pie and sat down to watch, not really knowing exactly what to expect. The episode started off with a bang – literally. BOOM! Dean Winchester hits the floor, wrestling with….a giant stuffed dinosaur?? BOOM! In comes Sam Winchester, leaping into frame. We have a lovely moment of Winchester teamwork as Dean yells for Sam to roll out of the way and tosses his lighter to send the giant plushie bursting into flames.